I have previously tested Qi wireless charging receiver model Universal Qi Wireless Charging Receiver Kit For Micro USB Cellphone.This Universal Qi Wireless Charging Receiver Kit For Micro USB Cellphone a about a size of a credit card and ultra-thin in design. It is designed so that it could be installed inside cell phone – or it can be put between your smart phone and it’s protective case.The charger promises to give out 1000mA 5V to the micro-USB connector that plugs to the smart phone like normal charger. I had used the charger for some months nicely with several Qi chargers. The biggest downside on this charge receiver was that when it is plugged to your smart phone, you can’t use normal USB charger to charge phone unless you remove this charge receiver. 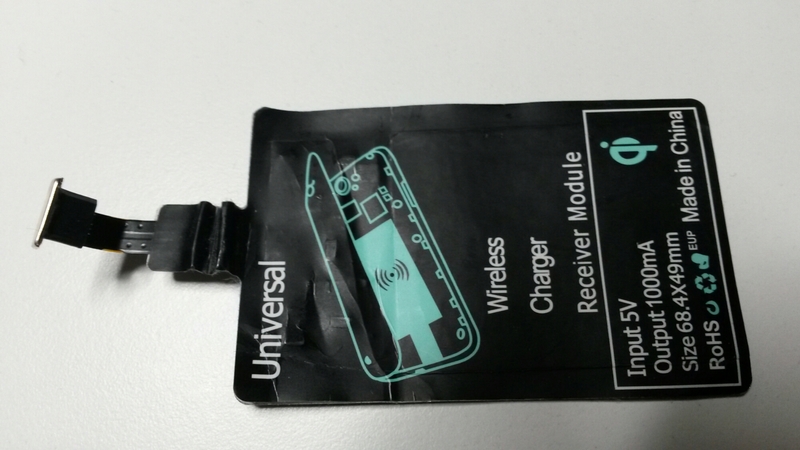 There has been several cases where I have had need to use normal UBS charger, so I have had needed to remove the Qi receiver from phone. At one occasion I removed the Qi receiver and put it to pocket, I happened to bet the Qi charge receiver so much that it did not work anymore. So now it is a good time to look what is inside it, because when it is already broken, there is no danger of making situation worse by opening it (and in best case the problem could be found and it could be repaired). 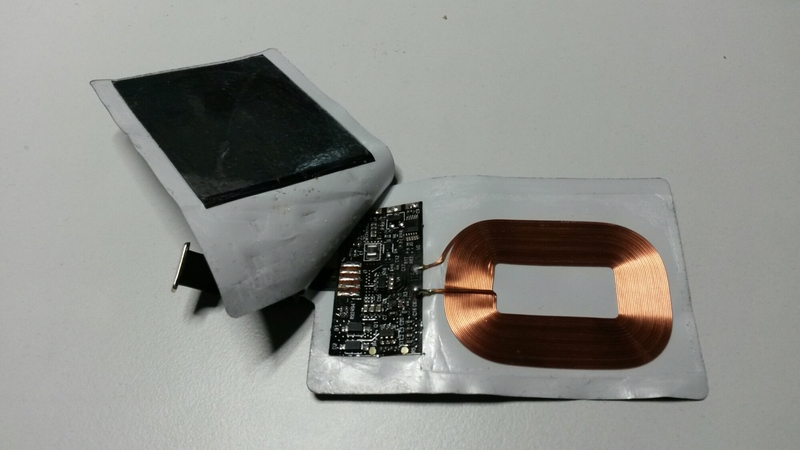 The device was packed inside two thin stickers made of plastic sheet. The sticker glue kept the both sides together. It was pretty easy to separate the sides with suitable tool (small thin screwdriver). Here is what is inside the Qi receiver. On the left side the black square looks like some kind of ferrite material but it but it is flexible. I quess it is some king of plastic with lots of ferrite material in it. Magnet sticks to it well. On the right side you see the electronics that do the charging. There are two ICs and lots of discretes. The bigger one (with 10 pins) does not have any markings in it. The smaller 6 pin chip has some markings, but they were unreadable. Here is close-up picture of the circuit where you can see that one end of the coil does not make contact with the circuit board anymore. Hi do you have any pictures on the micro usb connector? Is it possible to open it? I did not find any reasonable way to open that micro USB connector without completely destroying it, so I don’t have picture of that. In this video I’m testing a dangerous Wireless Charger (Qi Charger) from China. The efficiency is about 45% in the very best conditions. The transmitter has a poorly aligned connector which you have to fix yourself before you can use it. But the best is coming. The receiver has an overheating component, probably a resistor. It gets steaming hot and melts through the cover. 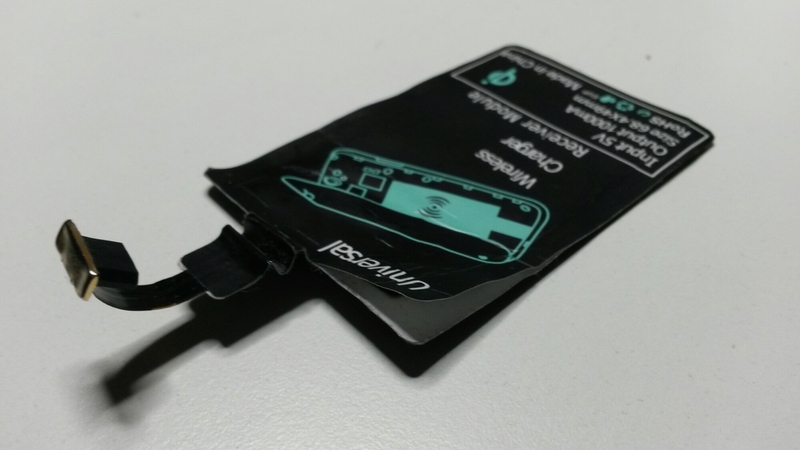 You are supposed to put the receiver inside your smartphone, so it is squeezed against the battery. Yes, a red hot resistor is pressing directly onto the flammable Li-Ion battery! This amazing device is going to set your mobile phone on fire or make it explode. In this video I’m testing a dangerous Wireless Charger (Qi Charger) from China. The efficiency is about 45% in the very best conditions. The receiver has an overheating component, probably a resistor. It gets steaming hot and melts through the cover. You are supposed to put the receiver inside your smartphone, so it is squeezed against the battery. 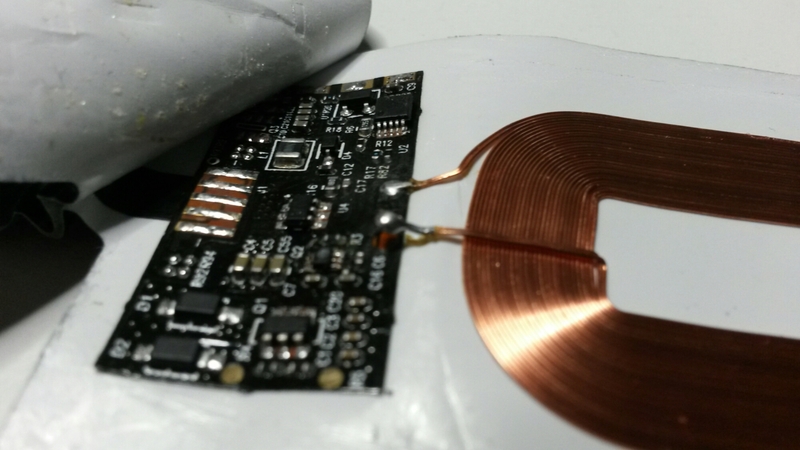 Yes, a red hot resistor is pressing directly onto the flammable Li-Ion battery! This amazing device is going to set your mobile phone on fire or make it explode.